Nutrients that are represented best in a bowl of cereal include fiber, protein, zinc, iron and B-vitamins, reports Dr. William Sears. 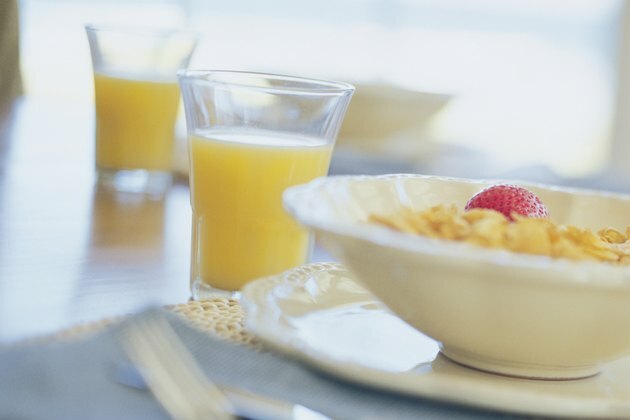 Eating a nutritious breakfast will provide you with energy to last you throughout the morning and can help control weight, explains to the Mayo Clinic. The best cereals, according to ShapeFit, are those that are a good source of protein, fiber and those that are least processed. The Mayo Clinic reports that fiber is best known for its ability to ward off constipation. It's also important for lowering the risk of developing diabetes and heart disease. The Harvard School of Public Health suggests eating at least 20g a day, which may be trickier than you might think. Kellogg's Special K, advertised as a healthy breakfast food, contains only 0.7g of dietary fiber, only three percent of the RDA, which falls short of the generic "frosted oat cereal with marshmallows" at 1.2g of fiber, five percent of the RDA. General Mills' Fiber One contains 14.2g of fiber, 57 percent of the RDA. According to the Center for Disease Control and Prevention adults should get between 46 and 56g of protein daily and kids should get between 13 and 52g. Harvard explains that dietary protein helps maintain the immune system. Protein is also known to benefit heart health and may modestly reduce the risk of developing Type 2 diabetes. Dr. Sears suggests consuming cereal with at about 4g of protein, which would include Kellogg's Special K and Health Valley Granola. Zinc is an essential nutrient needed for the maintenance and metabolization of cells. The Office of Dietary Supplements, known as the ODS, indicates that kids under the age of 19 should get between 3 and 8 mg of zinc and adults should get between 8 and 11 mg daily. When it comes to the representation of zinc in cereals, this nutrient is all over the board. Dr. Sears recommends that your cereal contain about 40 percent of your daily zinc intake. A sugary cereal with marshmallows may have about 2.2 mg of zinc – 15 percent of the RDA – while a healthier cereal with low levels of saturated fat and cholesterol has only 6 percent of the RDA. General Mills' Multi-Grain Cheerios contains 103 percent of the RDA of zinc. Folic acid, niacin, thiamin, riboflavin– they're all B vitamins that serve different purposes in the body. While most cereals have some or all of these vitamins, to get the most out of your food, look for a cereal that contains about 40 percent of your B-vitamin RDA. Folic acid, also known as vitamin B9, helps cells grow and reproduce. Niacin, or vitamin B3, is responsible for nervous system functions and gastrointestinal health. Vitamin B1, or thiamin, helps maintain appetite and growth and riboflavin, vitamin B2, helps cells function normally. Fiber One and a generic sugary cereal with frosted oats contain about 25 percent of your B-vitamin RDA. Cheerios has a higher percentage of B-vitamin content ranging between 25 percent to 68 percent of the RDA. Special K is also a great source of B-vitamins ranging between 35 percent to 101 percent of the RDA. Iron, an essential mineral, helps transport oxygen throughout the body. An iron deficiency could cause fatigue and a decreased immunity, according to the ODS. The RDA of iron for children is between 7 mg to 15 mg daily. For adults, it's between 8mg and 18 mg daily. Cereals that provide the most iron include Kellogg's Product 19, General Mills Total and Post Grape Nuts.